Most of our products are available for delivery within an average of just 3-4 days. However, occasionally you might need a product delivering on a next day service. The first step is to check the product is in stock at our York Depot. You will see the stock status of a product once you have selected the product option. The majority of products have an option, such as Chrome or Brushed kitchen taps or Black, White or Cream sinks. It is important that you first select the option before looking at the stock status. Some products will not have an option to choose from and therefore the stock status will be shown without needing to make any selections. Once you have added your products to the basket and begun the checkout process you will get to the Delivery Options page. On this page you will be able to select the exact delivery date you require (see delivery terms when booking). 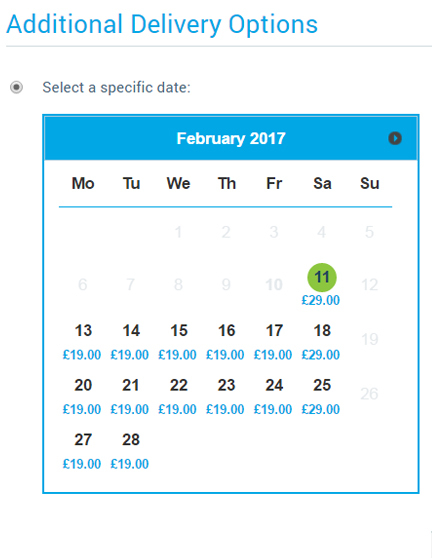 The Select a Specific Date calendar will give all the available delivery dates including a next day option (Shown here in green). Depending on your exact location and the type of product, the charge for next day delivery will be shown underneath the date option. We have a number of options within this section which include Super Saver Delivery. The cheapest way of having your product delivered using a standard delivery option. Within this section, you will also have the option of choosing Click and Collect. This option gives you the choice to have your order prepared and checked, ready to collect from our York Depot. An Exclusive and Unique facility allows you to select Next-Day Delivery, Select an Exact Day, Click and Collect or Super-Saver.